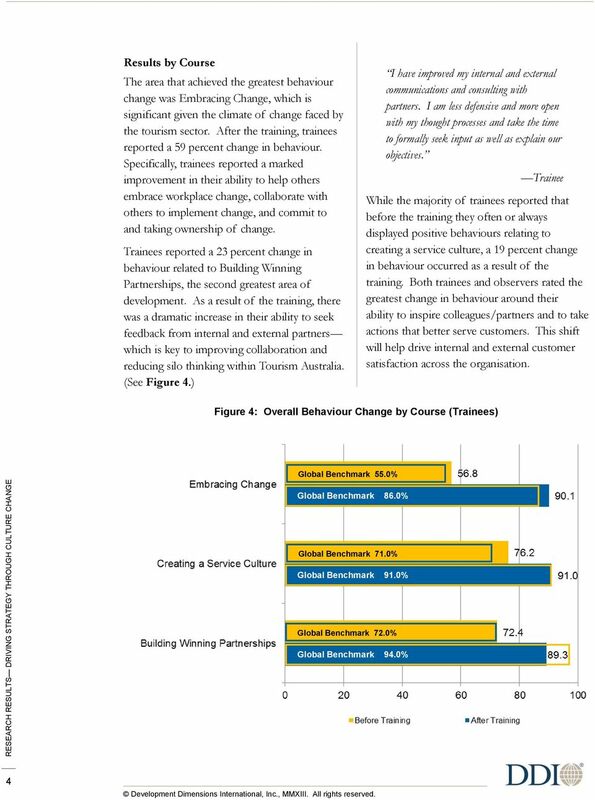 Download "DRIVING STRATEGY THROUGH CULTURE CHANGE"
1 RESEARCH RESULTS CLIENT RESEARCH RESULTS BY: PAULINE NOLTE STRATEGIC ACCOUNT MANAGER SAMANTHA YORK MARKETING CONSULTANT REALISATION RESULTS: Since attending the Behaviours Imbedding Program, trainees are effectively displaying their behaviours 25 percent more often than before the training. 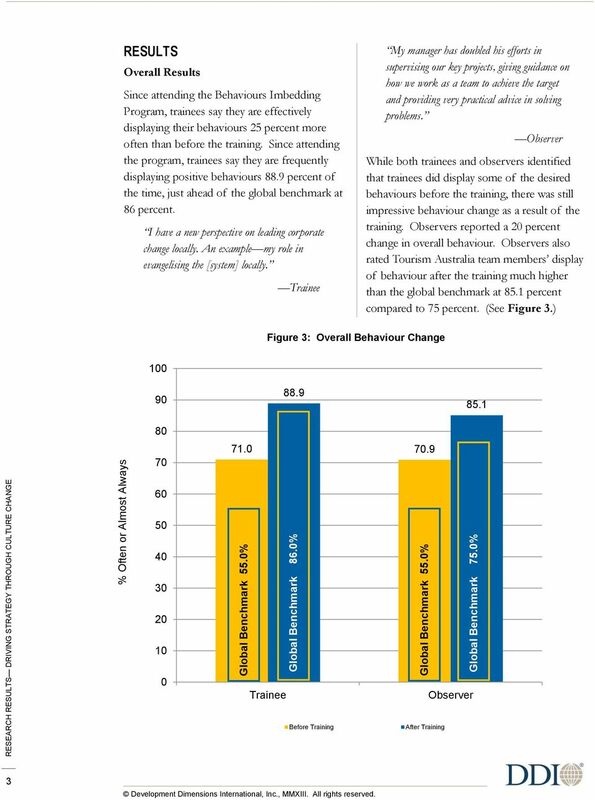 Overall, both trainees and observers identify that trainees are displaying behaviours more frequently than the global average. 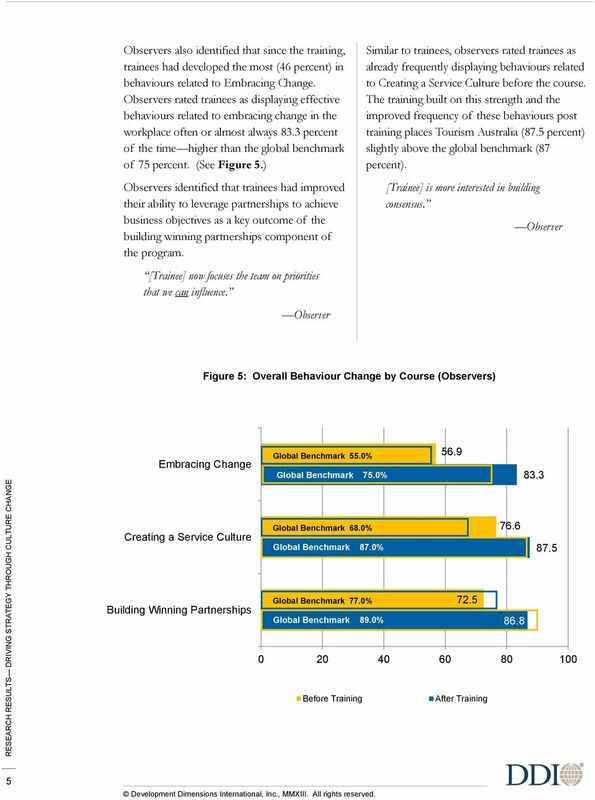 Three quarters (75.5 percent) of trainees reported they are personally motivated to apply what they learned in the training. 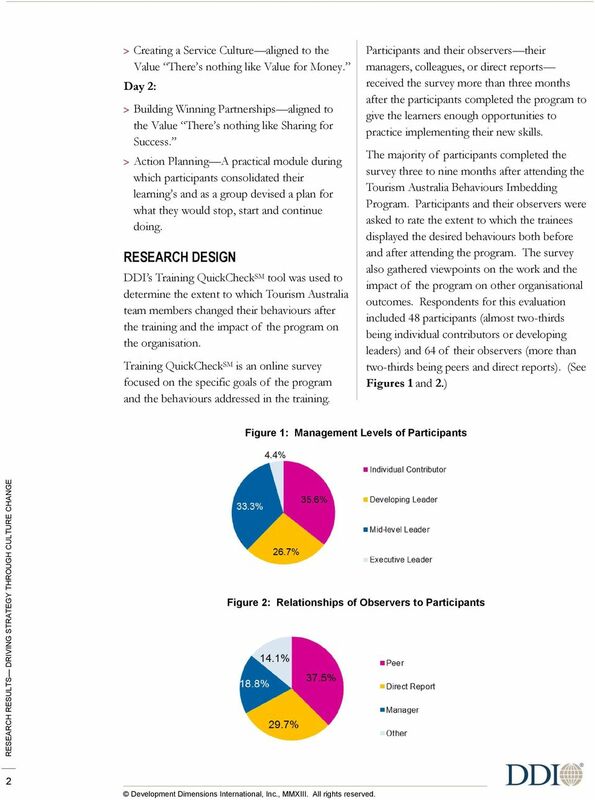 DRIVING STRATEGY THROUGH CULTURE CHANGE INDUSTRY Tourism/Marketing LOCATION(S) China, Germany, Hong Kong, India, Japan, Malaysia, New Zealand, Singapore, United Kingdom, United States DDI PRODUCT USED Interaction Management : Exceptional Leaders... Extraordinary Results (IM: EX ) and Exceptional Performers (IM: ExP SM ) BUSINESS NEED Tourism Australia is the Australian government agency responsible for attracting international visitors to the country and encouraging Australians to travel domestically for both holidays and business events. The agency is active in 30 markets with advertising, PR, media programs, trade shows, industry programs, consumer promotions, online and consumer research activities. Tourism is a significant industry for Australia, generating $97.7 billion in spending. The National Long-Term Tourism Strategy was launched in December 2009 to increase tourism s sustainable economic benefit to Australia. Tourism Australia recognised the crucial role it plays in driving the industry towards achieving its potential and they identified that their people are the key to their success. To support the realisation of the industry s national long-term objectives, a set of corporate behaviours and underlying competencies were created. Then, to ensure absolute clarity of roles and imbed the new behaviours in the organisation, Tourism Australia embarked on the workforce development journey to align its culture to its long-term 2020 strategy. 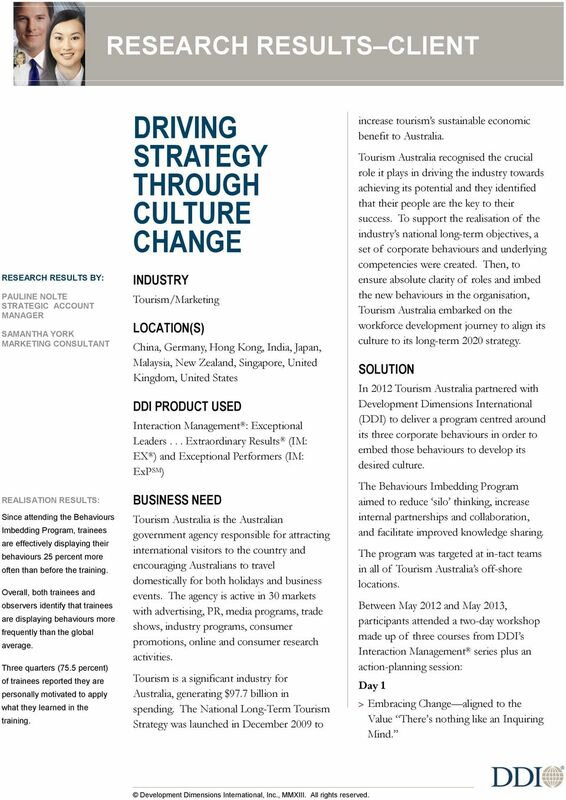 SOLUTION In 2012 Tourism Australia partnered with Development Dimensions International (DDI) to deliver a program centred around its three corporate behaviours in order to embed those behaviours to develop its desired culture. 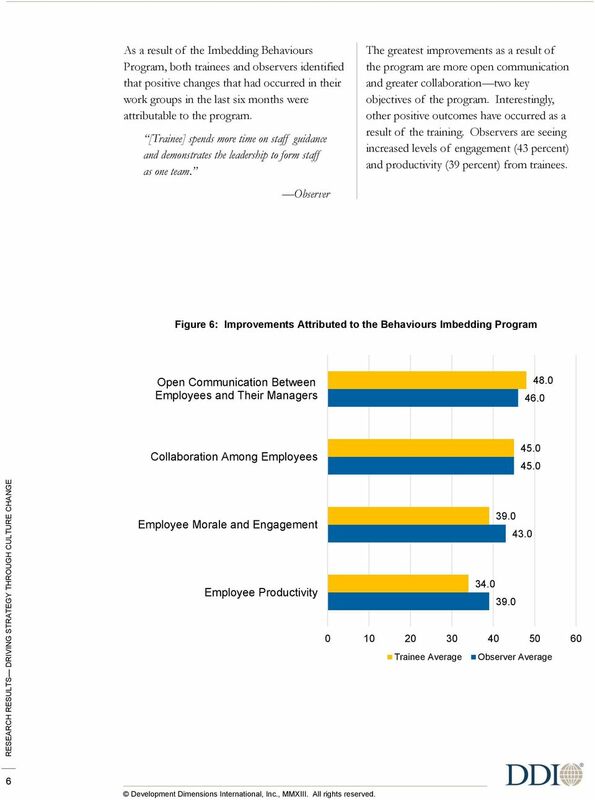 The Behaviours Imbedding Program aimed to reduce silo thinking, increase internal partnerships and collaboration, and facilitate improved knowledge sharing. 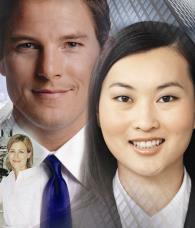 The program was targeted at in-tact teams in all of Tourism Australia s off-shore locations. Between May 2012 and May 2013, participants attended a two-day workshop made up of three courses from DDI s Interaction Management series plus an action-planning session: Day 1 Embracing Change aligned to the Value There s nothing like an Inquiring Mind. Statement of Corporate Intent 2013-14 Our Purpose At Medibank, we stand For Better Health. These three simple words sit at the heart of everything we do. They define why we exist and what we stand for. 1.1 To provide an overview of the actions taken with regards to the staff engagement survey and the associated action plan. An invitation to grow with us. Why join Grant Thornton? Overview. carried interest. Copyright 2014 by Cambridge Associates LLC. All rights reserved. Overview Cambridge Associates LLC Global ex U.S. Developed and Emerging Markets Private Equity and Venture Capital Benchmark Commentary Quarter Ending September 30, 2013 During the third quarter, in U.S. RECRUITING FOR CULTURE FIT ARE YOU GETTING VALUE(s) FROM YOUR SELECTION ACTIVITIES? DDI Australia Research Report 1 2 RECRUITING FOR CULTURE FIT ARE YOU GETTING VALUE(s) FROM YOUR SELECTION ACTIVITIES? Global Talent Management and Rewards Study At a glance Overview The 2014 Global Talent Management and Rewards Study provides an in-depth look at the practices and concerns of organisations around the globe. Did you know that Amadeus Altéa manages on average. passengers every second? Case Study. Driving culture change to achieve WCM status. What LEAP participants are saying about: Leadership. Engagement. Alignment. Warning Not all leadership development is created equal! QUICK GUIDE: Leadership Development That Measures Up The Talent Management Expert Question How effective is your organization s leadership development? 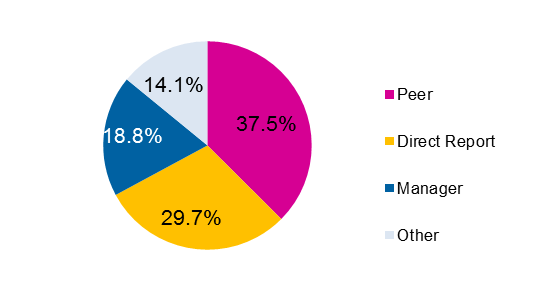 The Value of Financial Planning and Awareness of CFP Certification: A Global Financial Planning Survey Singapore Results 1 Copyright 2015 Financial Planning Standards Board How was the global survey conducted?